1. 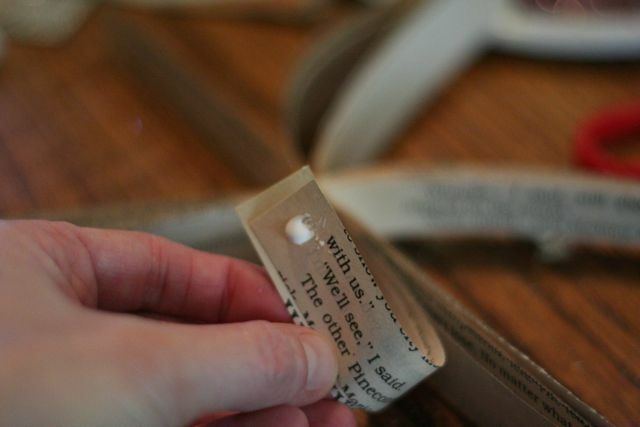 Cut the book into 1 inch strips. Now this part is a bit tricky, it would be easy if you have a industrial size paper cutter. I had to use scissors and this book wasn’t huge so I cut a few strips and cut a few more until I got through the whole book, leaving the binding in tact. 2. 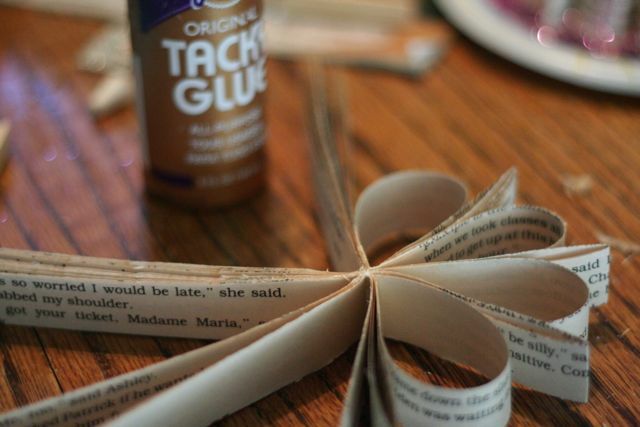 Take some glue and apply to the binding. 3. 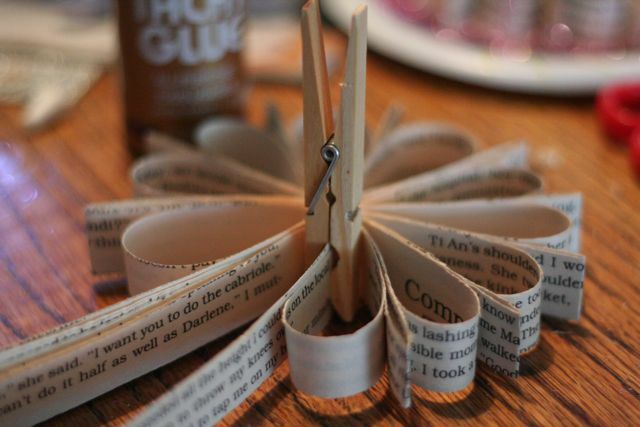 Use a clothespin to hold the binding together until the glue dries. 4. 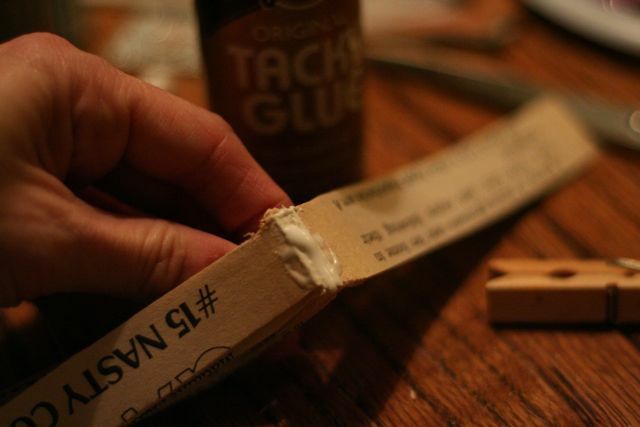 You will be using two strips at a time and start by putting glue on the end of the strip and glue to the next two pieces. 5. Then you take the next two strips and fold in half. 6. 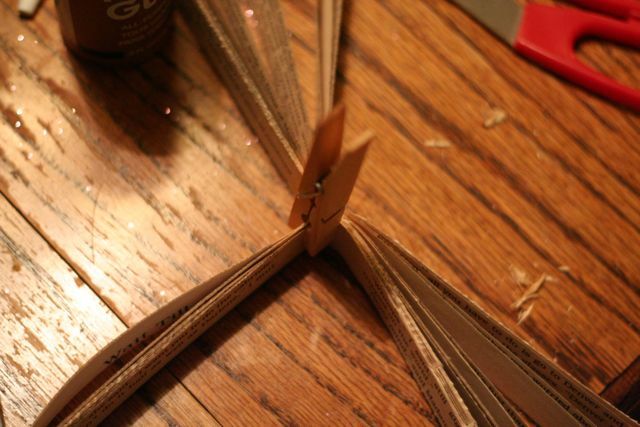 You can use the clothespin to help keep the strips in piece, its just like having another hand. 7. 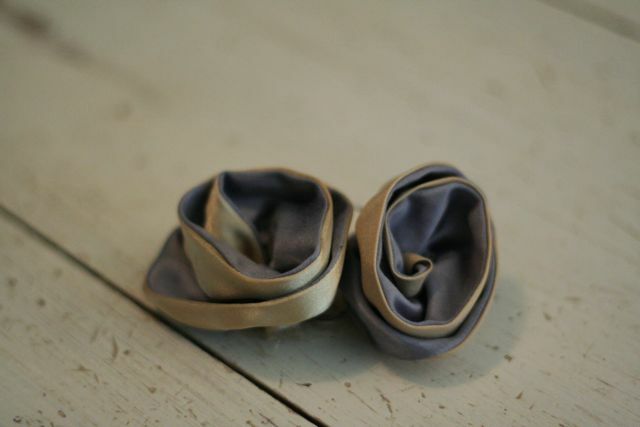 Continue folding & bending, putting glue on the end of the strips that you bend, not the ones you fold, until your done. 8. 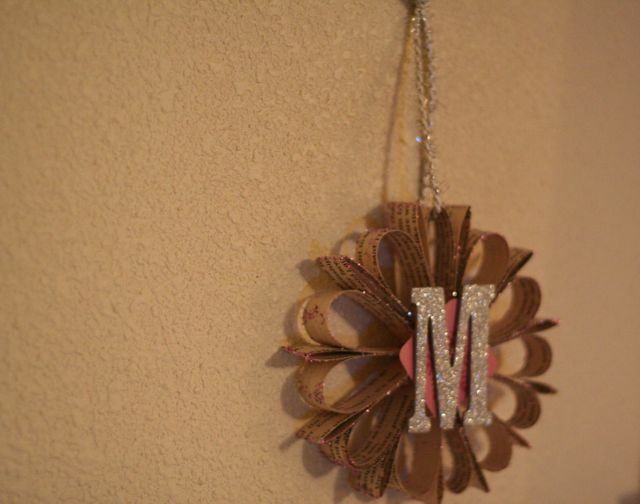 Take an all purpose spray adhesive and spray the ornament, then cover with glitter. Do both sides and edges if desired. 9. 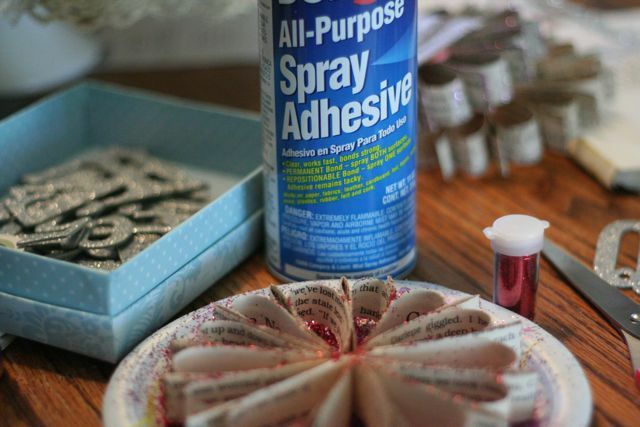 Take your embellishments and using hot glue or tacky glue, attach them. 10. 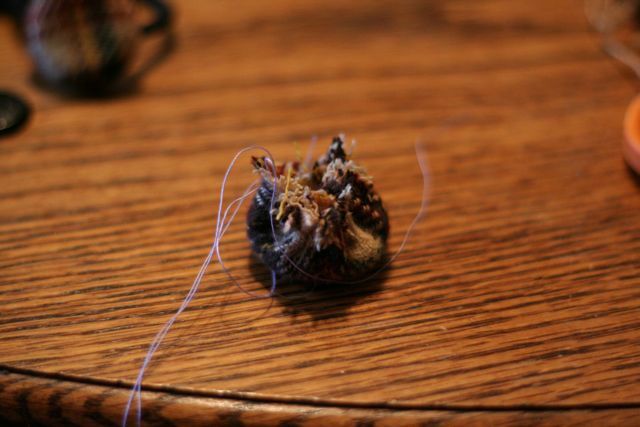 Once the ornament is completely dry, take a ribbon or some sort of decorative string and attach to the ornament. 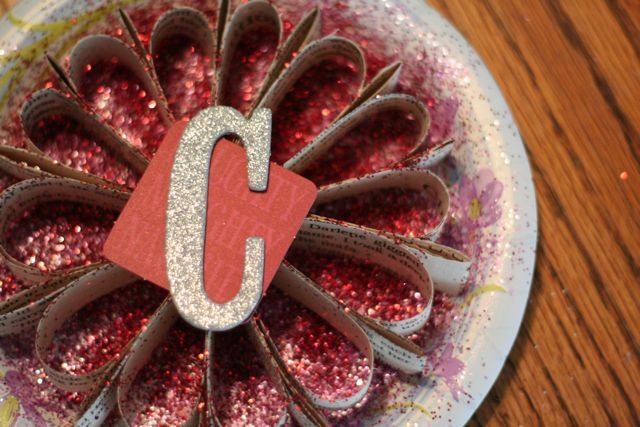 This entry was posted in Check this out!, Christmas, DIY, Holiday, Recycled, tutorial on November 4, 2010 by Deanna. Last week my mom gave me a box full of vintage fabric scraps. She didn’t realize how much I would love those scraps, in fact she told me if I didn’t want them I could just toss them in the dumpster. I tried to explain that these scraps are too beautiful to be dumped in a dumpster. I spent a day machine and hand sewing 30 flowers from the scraps. 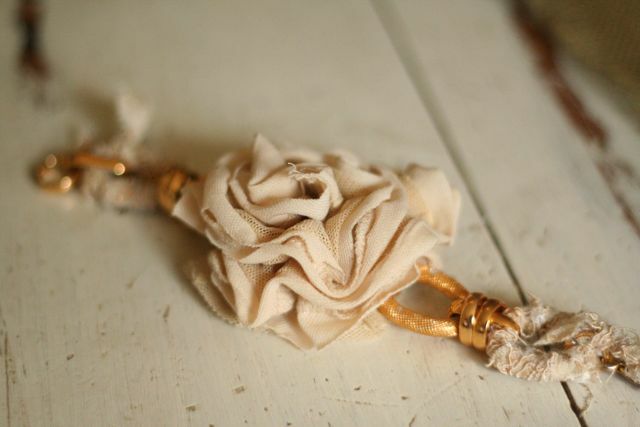 They make the most beautiful fabric flowers. When I called to tell my mom thank you, I asked her where the scraps were from and she said they were my Grandmothers, which makes them even more special to me. 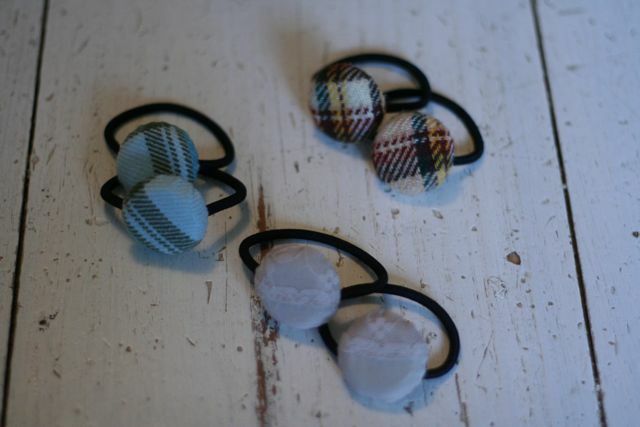 I am excited to make a special broach for each of my sisters for Christmas out of our Grandma’s fabric. 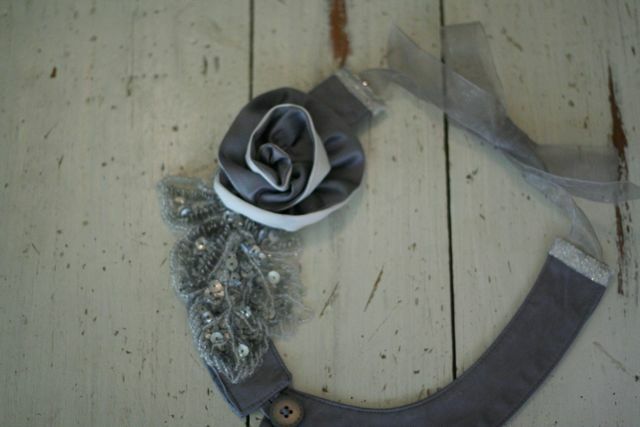 This bib necklace connects near the flowers with a vintage button and loop. 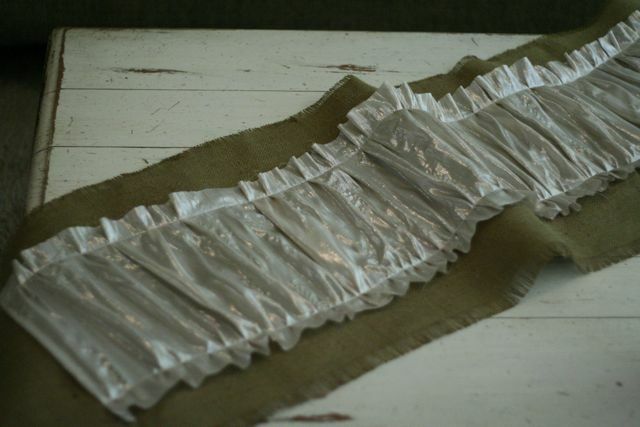 I gathered fabric for a ruffle and backed it with some velvet so its soft against your skin and attached rhinestones to the ruffle for some sparkle. The 3 flowers have a piece of flowered lace behind them. This entry was posted in Check this out!, I made this!, Recycled, vintage on October 22, 2010 by Deanna. 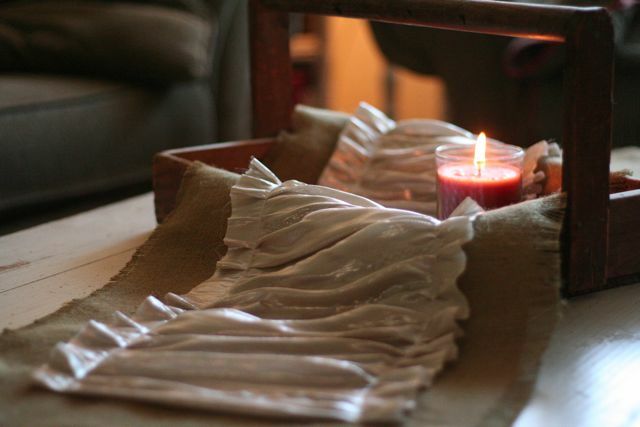 I love this table runner, I saw this over at The Shabby Chic Cottage and was happy to finally find a use for my burlap that I picked up at Scrap. The shimmery material is from a brand new Anne Klein shirt that I found at the bins last week. I will be using this runner all through the holidays. 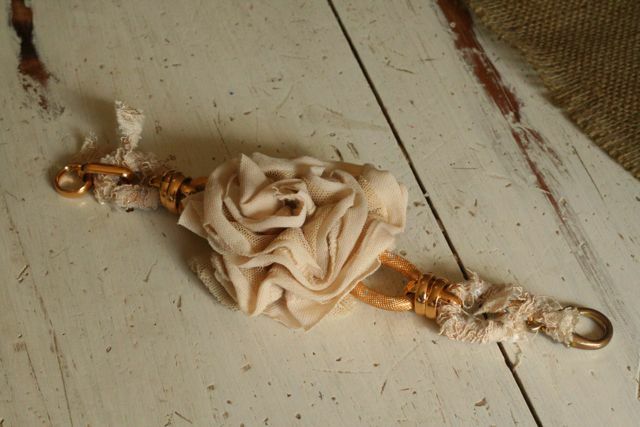 I love the shimmer and shabby look together. 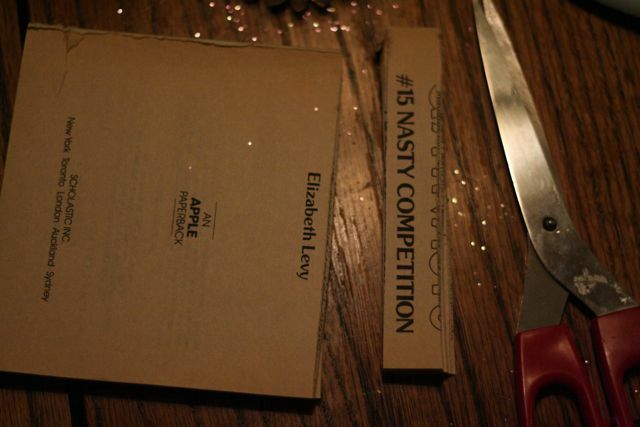 This entry was posted in Check this out!, DIY, I made this!, Recycled on October 13, 2010 by Deanna. I was laying in bed not able to sleep and started thinking of birthdays that were coming up and what I could make for those people and all of the sudden I came up with the idea to use two pieces of fabric sewn together and gather them for a two toned flower effect. So the next day I tried it and well I love how they turned out so I am going to be making a bunch more for headbands, hair clips, necklaces, you name it and these flowers would be gorgeous on it. 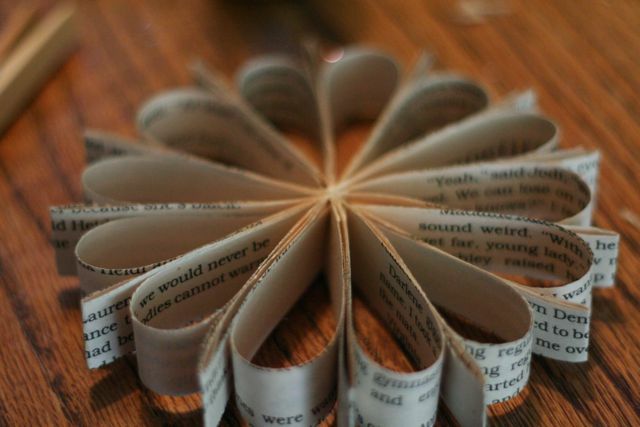 I will give you step by step instructions on how to make these flowers next week. This entry was posted in Check this out!, I made this!, Recycled on October 1, 2010 by Deanna. 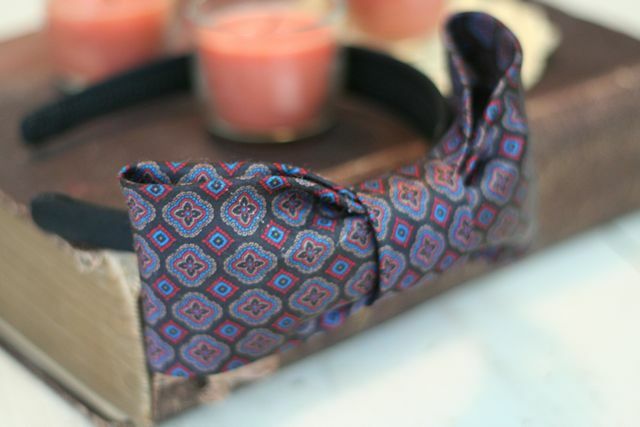 I wasn’t looking to do anything with a silk tie but when I saw the colors of this old tie I had the idea to cut it up and see what kind of bow I could make out of it for a headband. 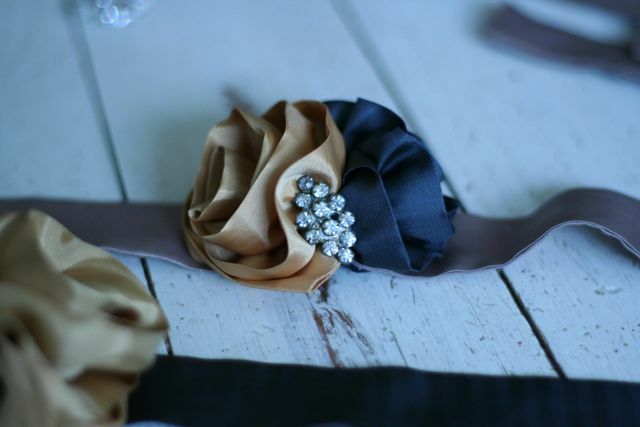 Some say the bow is a bit big but the colors are perfect for fall. This was fairly simple. I just tried it out and didn’t measure so I don’t have a tutorial but I will be doing this again so check back. This entry was posted in Check this out!, I made this!, Recycled, repurpose, upcycle on September 13, 2010 by Deanna. 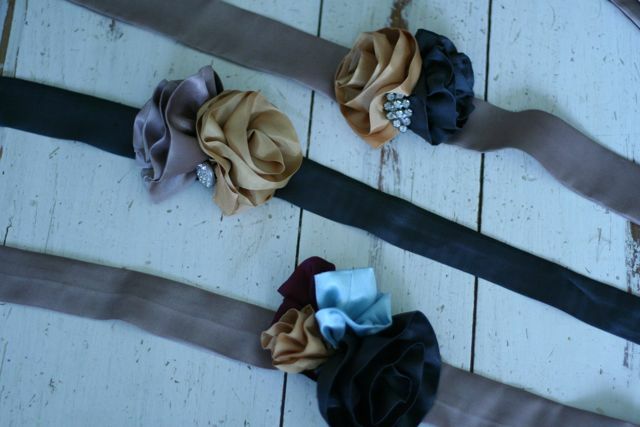 I have been having fun making these wrist corsages. 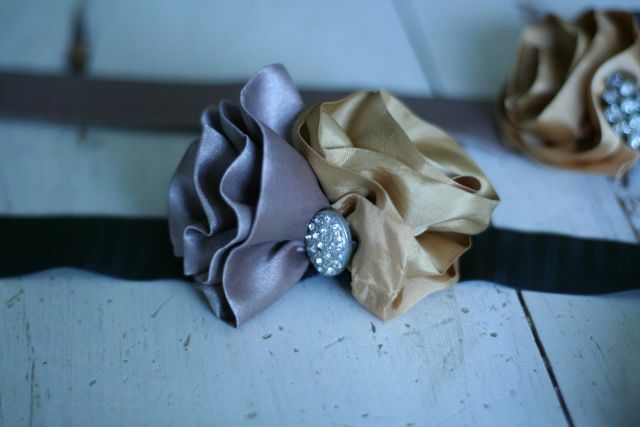 Its fun coming up with something so delicate and dainty. Its not the easiest to get on by yourself because they tie on your wrist but I find that’s what makes it them so feminine. 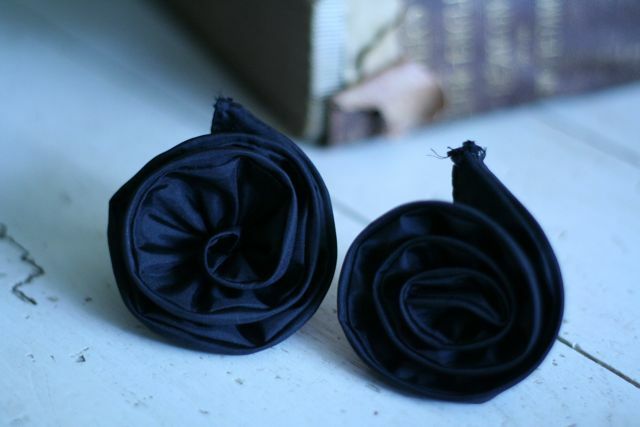 And adding a little vintage jewels here and there make these the perfect dinner out or party accessory. 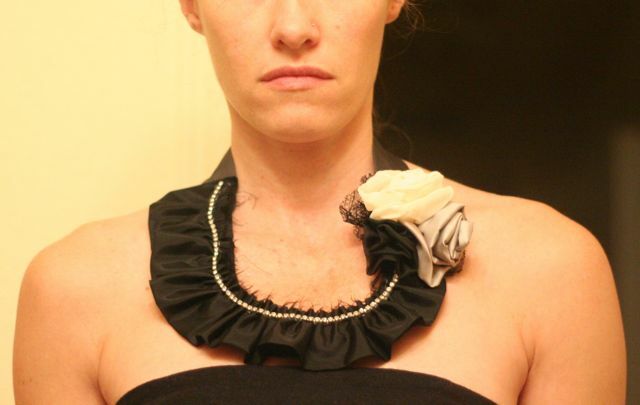 This entry was posted in Check this out!, Recycled, upcycle, vintage on September 9, 2010 by Deanna. I have had all these bottle caps laying around and yesterday day it dawned on me to try them out as ponytail holders. 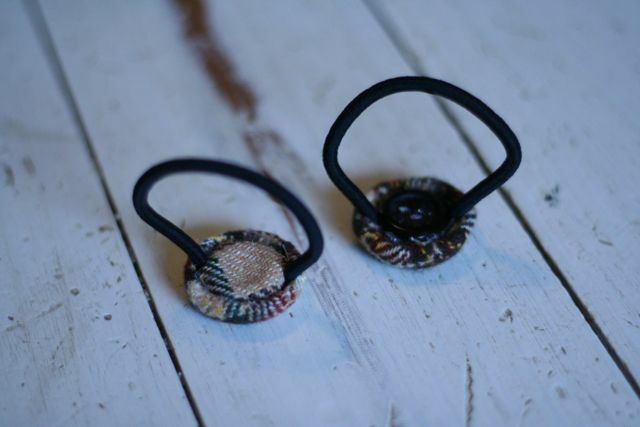 I had been looking at the cute vintage button bobby pins that have been covered with fabric and I looked at the bottle caps and wondered if I could do the same thing and well the answer is YES! And I hope you try this one, they would be great for stocking stuffers. I know its a bit early but with school starting today, it always gets me thinking about Christmas gifts. 1. 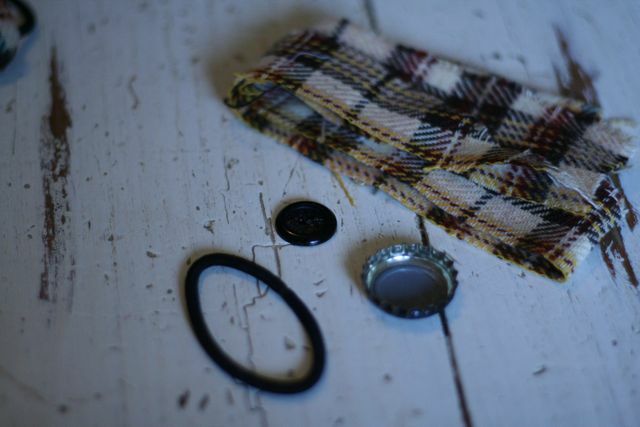 Cut out a piece of fabric about an inch outside the bottle cap. 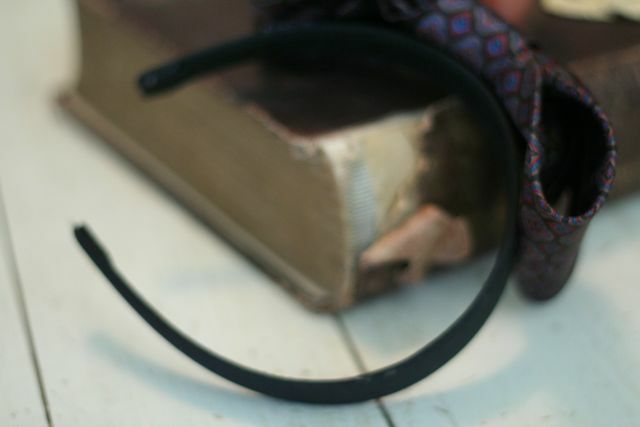 Sew around the circle with the longest stitch your machine has or by hand and gather as you go. 2.Stick the bottle cap inside. It should look like this. 3.Hot glue the gathered section down into the bottle cap. Put more glue in the bottle cap and secure the ponytail holder in place until its dry, making sure to cover completely with glue. 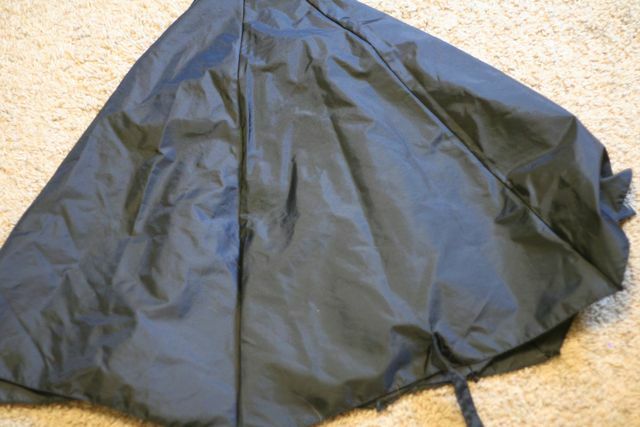 4.You have the option here to cover your button with fabric or not. 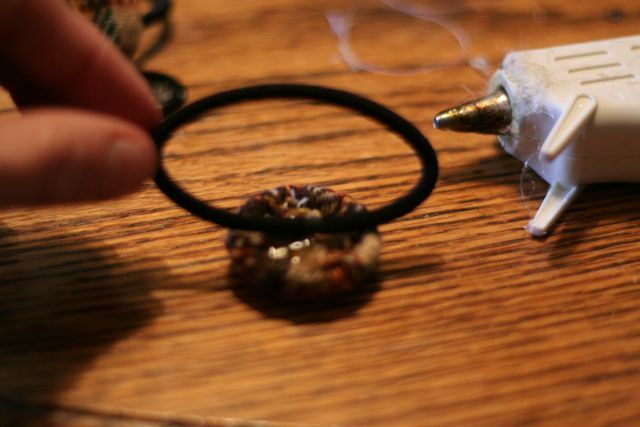 Next put more glue on top of the ponytail holder and secure with your covered or plain button. 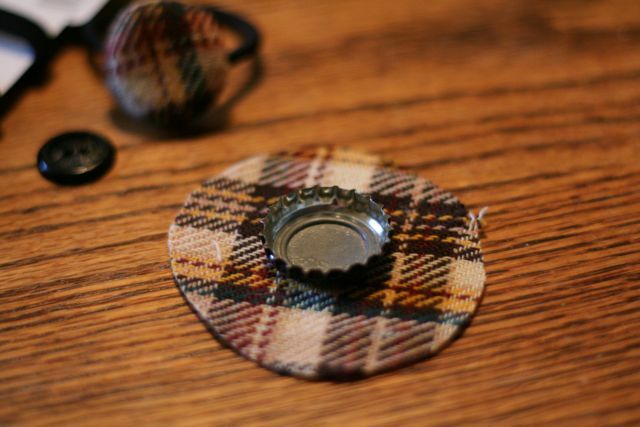 You can use any fabric, but if you use see-thru material, make sure you use plain(no logos) bottle caps, or else the logos will show through. This entry was posted in Check this out!, DIY, I made this!, Recycled, repurpose, tutorial, upcycle on September 8, 2010 by Deanna. I was at SCRAP again, looking for school supplies for my girls, but of course I had to check out their selection of fabric. I was shocked to find an umbrella top rolled up in the pile and thought I must take it and see what I can do. Well I seem to have this flower fetish because I’m constantly making flowers, and yes I used two sections of the umbrella for flowers. 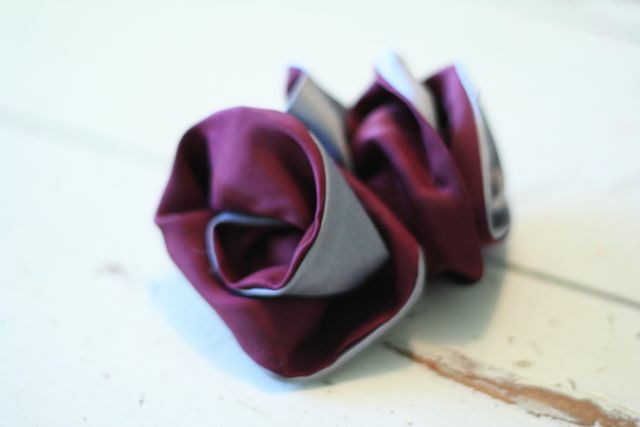 I cut on the seams and that made the flowers stiff and made their shape a bit different than other fabric. 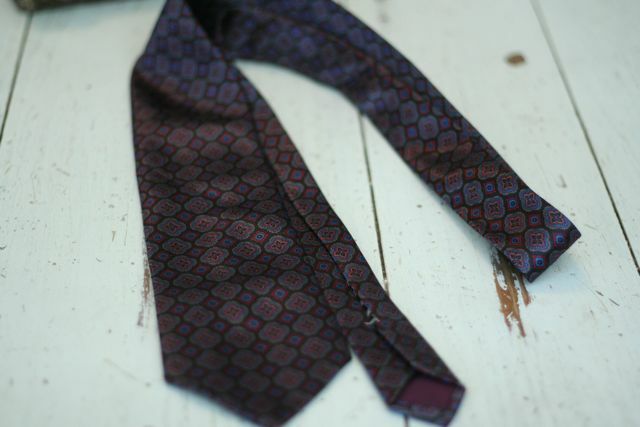 A word of advice that you may already know but just in case – don’t iron them, they will melt. 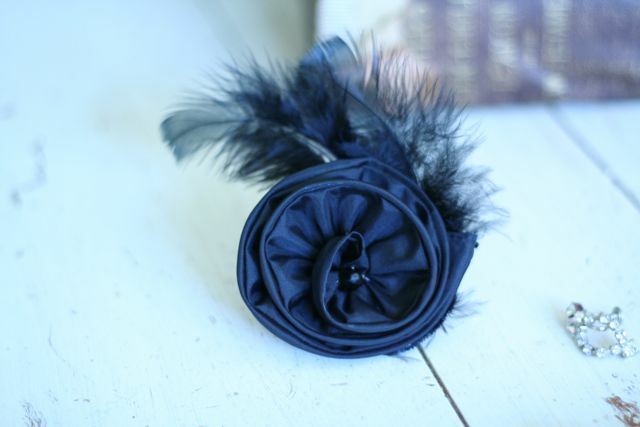 Here is my finished hair clip accented with feathers. 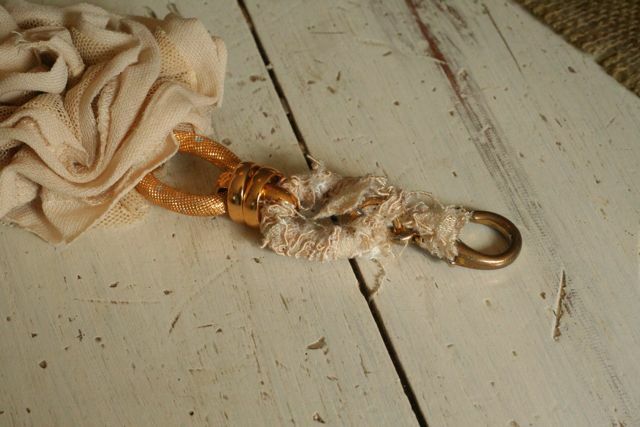 So if you have an old umbrella laying around that’s broken and cannot be fixed, don’t toss it, take the top off and think of ways you can re-use it. 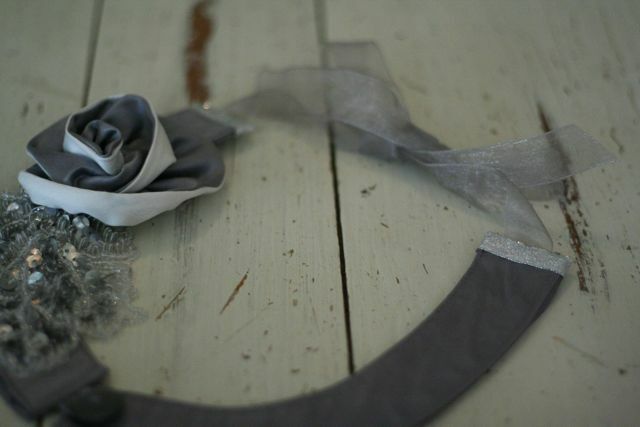 This entry was posted in Check this out!, DIY, I made this!, Recycled on September 6, 2010 by Deanna.